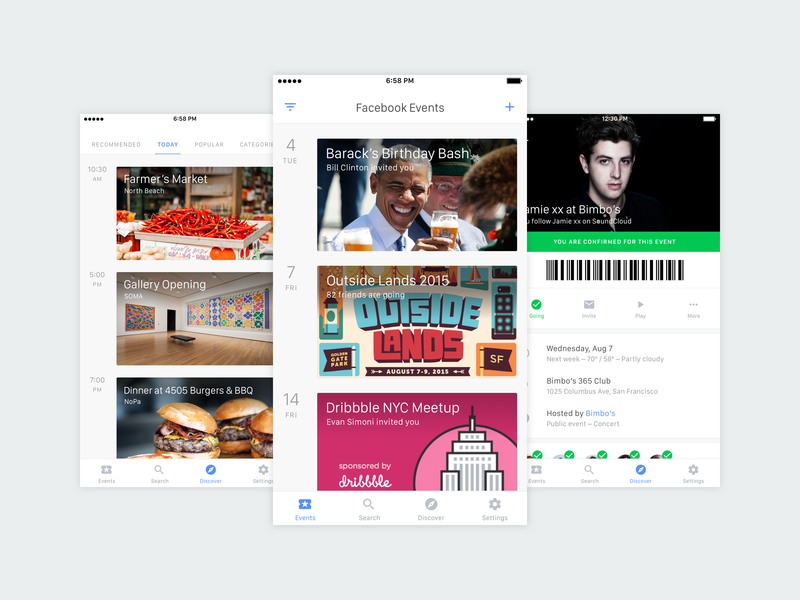 What about Events merits its own app over other Facebook products? Social media has long been criticized as isolating and unproductive. Events is the clearest example that Facebook brings people together meaningfully in the real world. Events will be one tap away. 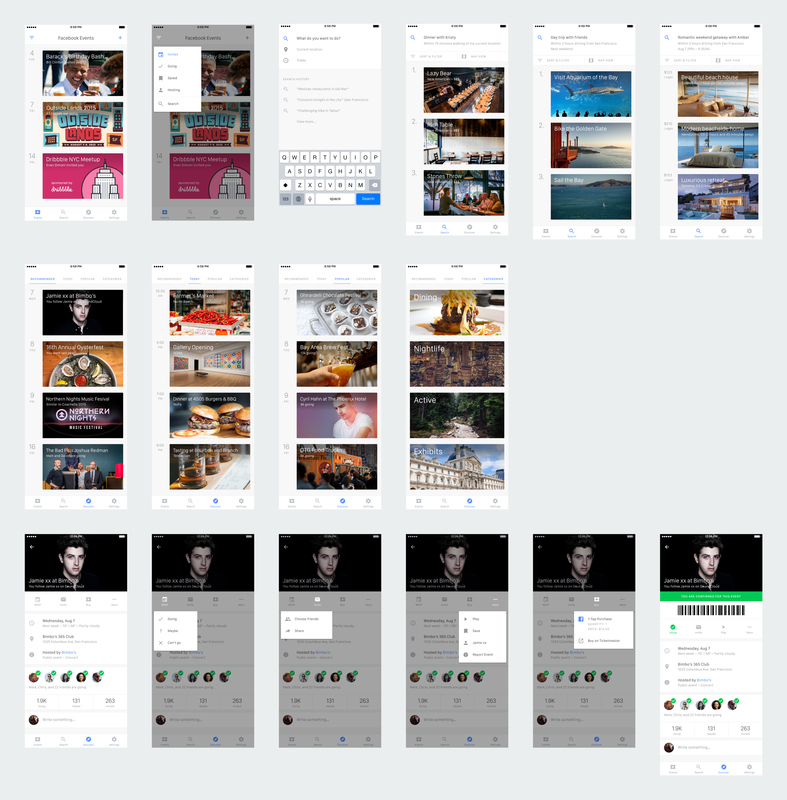 By pulling Events out of Facebook’s main app, people can access a more powerful Events product in one tap, rather than three. Facebook Messenger, Instagram, and Whatsapp show that the long-term benefits of a standalone app far outweigh the short-term costs of migration. Over the past couple years, several tech companies have realized this and formed their own ‘app constellations.’ For example, Instagram has added Hyperlapse and Layout. 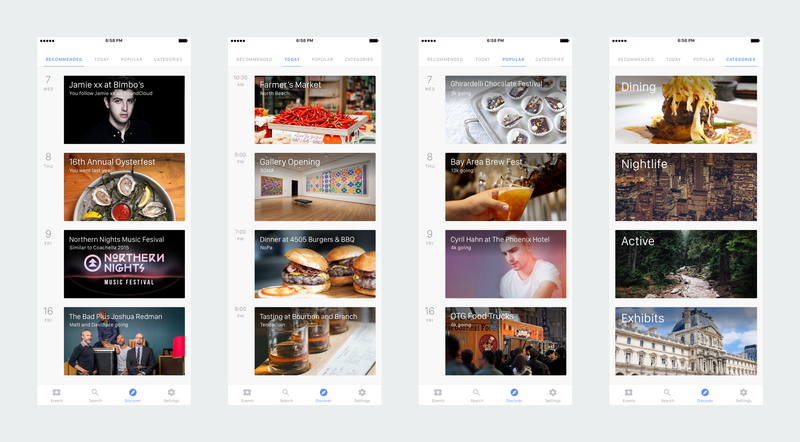 Dropbox has released Mailbox and Carousel. Google has a staggering 53 apps on iOS, and Facebook has 23. Tickets will be one tap away. View flow from left to right, top to bottom. The process of purchasing a through TicketFly from a Facebook event page took 8 minutes, over a dozen steps, and occurred across Facebook and Safari. Buying tickets is particularly convoluted and time-intensive. You have to find the event listing, create an account, confirm your account through email, find the event listing again, enter your credit card information and billing address, and finally complete your purchase. What’s worse is that you have to do this many times over. You might buy tickets for a concert through Live Nation, a conference through Eventbrite, a sporting event through Stub Hub, and a theater performance through the venue’s website. In my concept, you only need to provide your billing information one time, and Facebook will securely handle the transaction. This would work similarly to Amazon’s 1-Click Ordering or the Check out with Paypal button. Though the majority of events currently on Facebook are large and planned well in advance, the bulk of most people’s day-to-day activities are small and improvised. Facebook can play a bigger role in people’s lives by enabling everyday spontaneity. The goal of Today is to inspire you to live more adventurously and make the most of your time — now. Events will match preferences among friends. First, a quick story. I was spending time with a friend a couple weeks ago, and we weren’t sure what to do for dinner. After a couple fruitless minutes on Yelp, I suggested sushi, my friend replied, “sure,” and we started walking to a nearby restaurant which we had both already been to. The second we arrived, I realized my friend doesn’t eat seafood. I should have remembered this important detail, but I didn’t. My friend could have nixed my suggestion, but she didn’t want to seem finicky. She insisted that we eat there, and we had a fine meal. It wasn’t the end of the world, but it was dissatisfying to know that we could have gone to a restaurant that would have suited our tastes better. 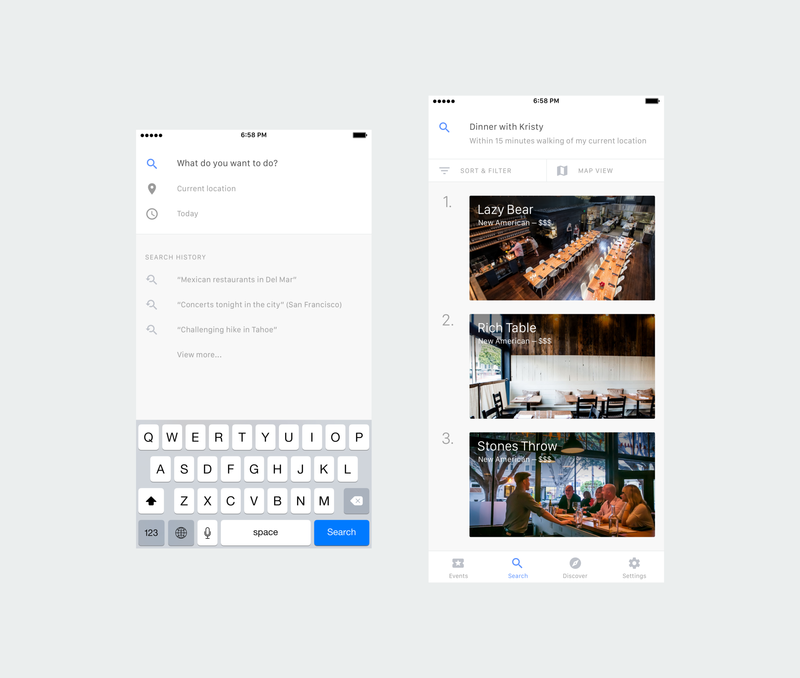 Since Facebook knows both our preferences, Events can suggest restaurants we would both love and haven’t tried before. In the example pictured above, Facebook detects our overlapping fondness for New American food and provides options within both of our budgets. Events will be integrated with your favorite services. Above: All four tabs of the Discover section. 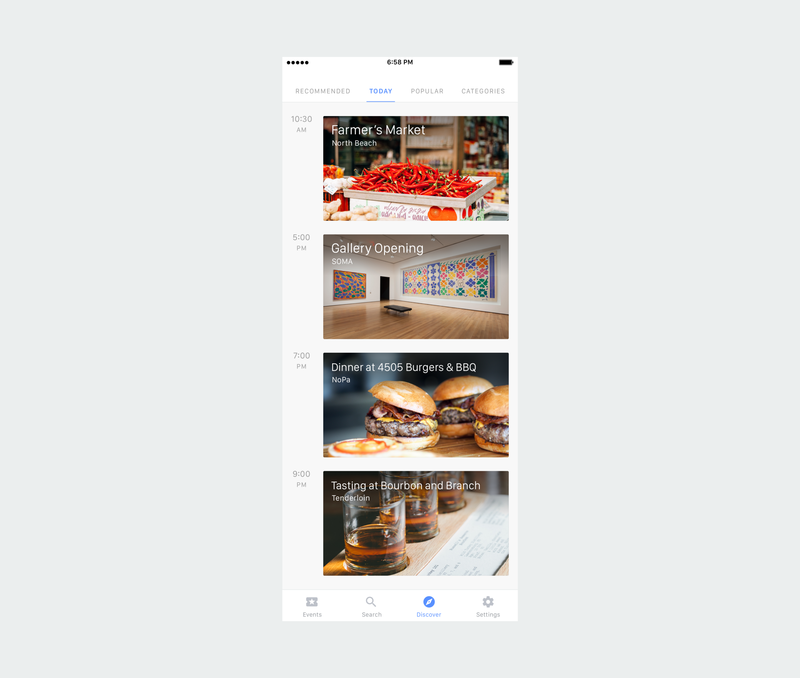 Facebook can personalize Events by inferring your preferences from your activity on other services. For instance, Events can suggest what restaurants to go to based on your Seamless and OpenTable history, accommodations to book based on your past Airbnb and HotelTonight reservations, and concerts to attend based on your SoundCloud and Spotify playlists. Facebook Connect would make it easy to incorporate this information, augmenting Event’s intelligence. Recommended content would be surfaced in search results and the discover section (pictured above). 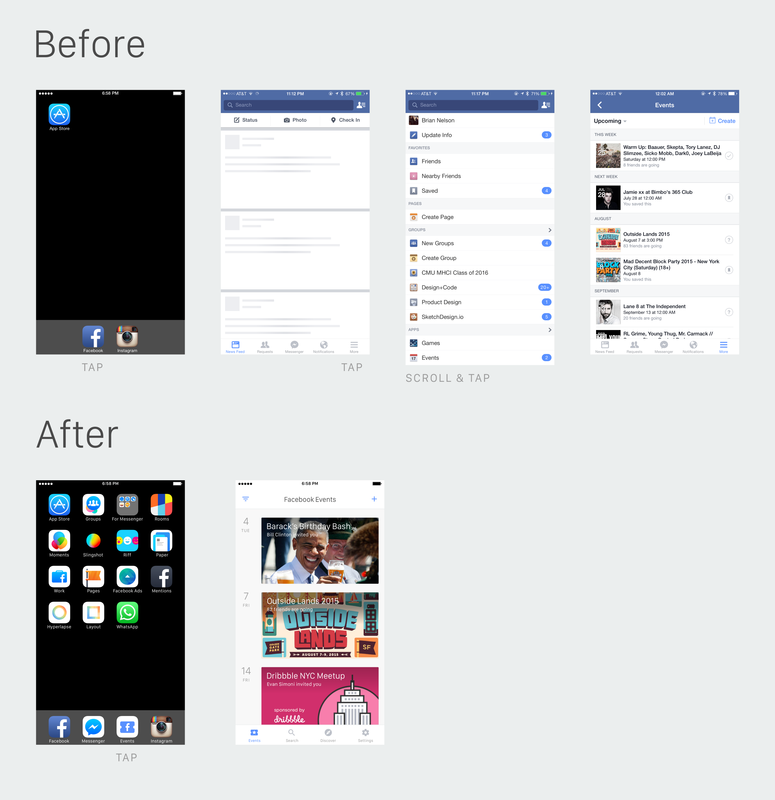 I don’t work for Facebook, and this app is not under development. This is just a concept, for practice and fun.